My fellow Seattle blogger Peabody is hosting a virtual house warming party to celebrate her new home in the real world — what a kool idea! Peabody asked her readers to “bring a dish” which she will republish on her blog. Peabody had been really bummed a few weeks ago that she missed the Nigella Express book signing event in Seattle, so I decided to bring a Nigella Express recipe to Peabody’s party, with a Mango Power Girl twist 😉 This is Nigella’s No-Churn Pomegranate Ice Cream with my twist – Marionberry Swirl and a Pistachio Topping, which I am sure the Domestic Goddess wouldn’t mind. I changed a few things around in the recipe, too. I used lemon juice instead of lime, just to use what was handy. I swirled in Northwest Marionberry Syrup from Lopez Island Farm to localize the recipe. I added pistachios for a crunch, and because they are an ingredient Nigella and I both love and use often. Here is video of Nigella making her pomegranate ice cream on NBC’s Today Show, and check out Culinary Concoctions by Peabody to join the party. Thanks mpg for another great recipe idea, I have a few poms in the fridge just waiting to be juiced. . . I just may have to leave work early to get on this one! Love the addition of the pistachios; my holiday guests will be in for quite a treat this year! I love the use of the marionberry…very PNW…and the pistachios(just cause they are so good). I am still jealous that you got to go see Nigella…and this is another reminder I need to get that cookbook. Thanks for bringing it to the party! Mandy – Thank you – love your blog! You should give it a try, I would love to see your version ;)Rebecca – Pomegranates is an amazing fruit – we just eat it like that – but another way I love it is in salad – just had a lovely salad tonight with pomegranates in it. And, forget the ice cream maker – this recipe is all hands – and it’s quick!Carol – is this Aunt Carol of ours? 🙂 I hope you give it a try, it will be an impressive treat for your guests and I am amazed how quick it is too – Thank Nigella for that!Peabody – local ingredients – just for you 😉 don’t be jealous – next time for local events like this, we’ll have to coordinate! This sounds delicious! I cannot wait until pomegranates are in season again here! This makes me want to buy an ice cream machine. And thanks for the comment! I love your photos…I could definitely learn a thing or two from your photography skills. What a lovely blog you have here! Gretchen – This is such a treat – if you can find pure pomegranate juice – it will work! Thanks for stopping by.Cabbages and Kings – That is the whole point – NO ice cream maker required – a beater and a strong arm is all you need…well, and the ingredients 😉 Thanks for the compliments, I feel like I have a long way to go in terms of photography, but I always see & learn from others, too! Looks delicious! Like your twist to it. this looks really yummy mo. 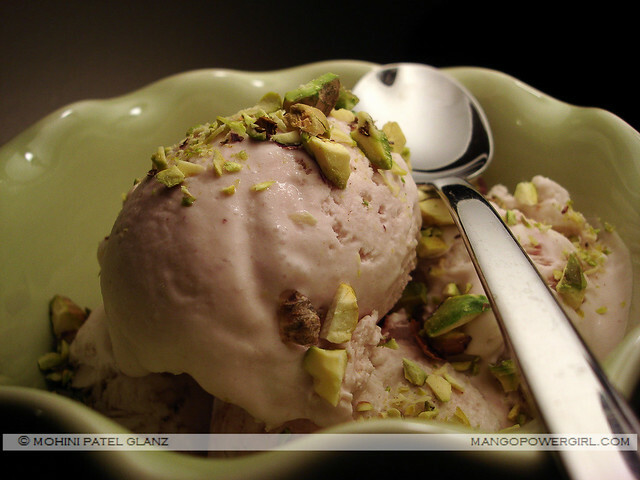 Pomogranate ice cream is not something u will find in any store. I’m surprised that u are even making some in that cold weather. I guess nothing beats the cold like some ice cream eh ? Pomegranates are plenty are here , will have to give it a try. M&Ms – Thank you! I love making it my own :)Sagari – Thanks! This was easy peasy!Kajal – We turn up the heat & eat ice cream ;)…My mother loves ice cream any time of the year, so she was real thrilled to get a home-made one as now she’s enjoying all the yummy Indian ones. Yea, do try it…I was amazed how easy it was. Also, check out my link to the video of Nigella making it. Hellow!I live in japan.I am studying about ice cream and sugary foods. And I would especially like to collect data about ice cream.Because of the link to your site.We hope to link this site please! Toro – Go ahead, feel free to link. Good luck with that ice cream study, I’d love to check it out if there is an English version.